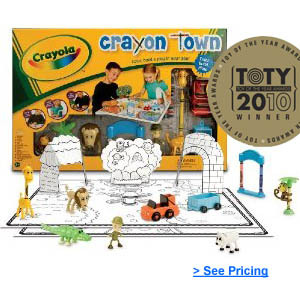 This 2010 Toy of the Year award winning set is perfect for a rainy day or indoor play. It is sure to spark creative and imaginary play for your kids. 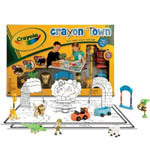 Kids can use the crayons not only to color the three-dimensional zoo scenes, but they can also use the crayons to build animals and other zoo components, which they can then play with. This play set is designed to last for a long time. You can buy any standard pack of Crayola Crayons to use with this set, so if the crayons from the set break or wear out, then they can easily be replaced. Crayola makes replacement color pages available online for a free download, so even once all the pages in the set have been colored, the fun keeps going with new coloring pages. 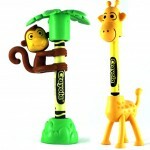 This toy comes with plastic figurines including the zoo keeper, monkey, giraffe, alligator, lion, and a polar bear. Also paper figurines including an all-terrain vehicle and wagon, a tree, the “Fold & Build” polar bear cave, a lion’s den, and a monkey tree. There are 2 coloring mats and 8 crayons.